The chance to work on real world projects for actual clients, a rigorous one-year ecologically-focused coursework, and Conway’s amazing professors/community. I stumbled upon the Conway School while I was researching a project I was working on for my Permaculture Design Certificate. I was immediately intrigued by everything about the program. I then visited the school for the fall presentations and I was thoroughly impressed by the high quality design projects presented by the students. Be patient and do not start to doubt yourself if you don’t find your dream job right away. I had a bunch of different jobs after graduation, and it took me a few years to find my current (dream) job. Connect with people and organizations who are working on interesting projects, you never know where a simple conversation will take you! 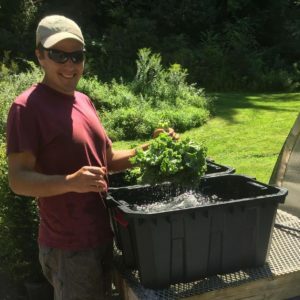 I am the farm manager for Greater Greens, a startup organic farm in Long Valley, NJ. I love being able to work outside with plants, while sustainably growing nutrient-dense food for our local region. The farm’s owners have huge plans for the businesses’ growth and we are planning on producing millions of pounds of organic produce annually within 3 years. We will be growing a diverse mix of annual vegetables and greens, as well as perennial fruits, berries, herbs, and flowers. We are also building an aquaponic greenhouse that will allow us to produce greens, vegetables, and fish throughout the year. I’m overseeing a staff of 6 workers and am centrally involved in the design and development of the farm from the ground up! Ecological landscape analysis and design, whole-systems thinking, public speaking, general organization, maintaining client relations, basemap rendering.